I've been tinkering with PC-88 style graphics for a project and I was under the impression that most games used a standard 8 color palette, with pure yellow, red, blue, etc. That is, until I ran across Misty Blue, which seems to have a completely unique color palette. Can someone explain how this works? Was it a later hardware revision that allowed Misty Blue to have these colors, or did most developers simply go with the standard palette for the hell of it, despite having the possibility of using colors from a larger color space? Just a hunch : maybe they used such standard palette to easily port between platforms. For example I never understood why some games were visually identical on PC98, X68000 & FM Towns while the 2 later have better graphical capabilities. The reason was probably cost and time pressure at the expense of full utilization of the hardware. At least that's my 2 cents. The original PC-8801 models could only use 8 colors. This is sometimes called digital RGB. It doesn't mean the output video signal is actually digital, but instead means that each RGB color is completely switched on or off. So (255, 0, 0)=red, (255, 0, 255)=magenta, (255, 255, 0)=yellow were possible, but not (32, 128, 200) or whatever. The PC-8801mkIISR model released in 1985 added analog RGB capability, enabling 8 gradations each RGB color, for a total of 8^3=512 colors. Still only 8 colors could be displayed at one time, but developers could select 8 colors out of 512 to display on each screen. The PC-9801 series is very similar. Originally it supported digital RGB only, but starting with the PC-9801VM model, supported 16 colors selected from 4096. 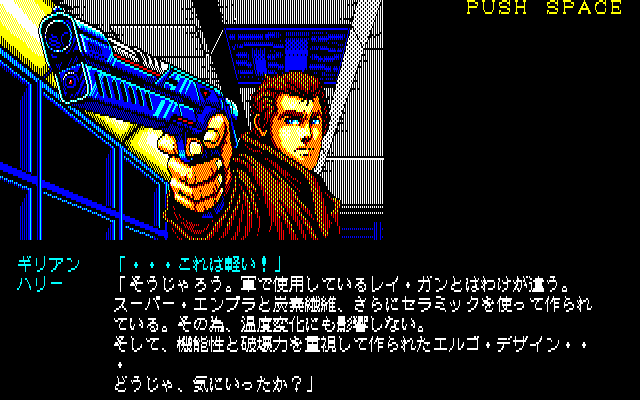 Both Snatcher and Misty Blue are PC-8801mkIISR, analog RGB games. 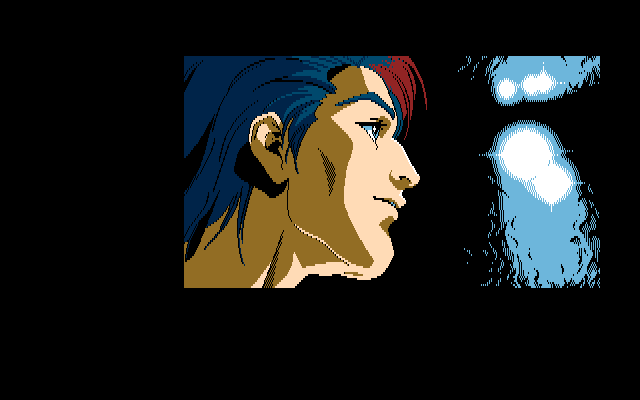 As for why Misty Blue looks better... well, the later Enix adventure games all look amazing. Better artists, I guess. Aha, so basically a 9 bit palette, like NEC's PC-Engine (which makes sense, I guess)! Still find it a bit curious that seemingly only a few games took advantage of this, even later Enix games like Jesus II "reverted" to the old palette. But making porting easier could be an explanation, of course.